BERLIN – A long, warm, coatless autumn made some wonder whether climate change might cancel winter this year in a reverse of the canceled summer two centuries ago in a year called “1800-and-froze-to-death.” But no, I now read that the weather will change after all. Northern blasts may soon be here. Perhaps economically as well? Two French economy ministers clearly felt the chill when visiting Berlin on October 20th, hoping to thaw out Angela Merkel’s icy “austerity policy”. Burdened with a 4.3 percent French budget deficit, above the European Union’s 3 percent limit, and with President Hollande’s popularity nearing the freezing point, these politicians called for a deal: If Germany would invest 50 billion Euros in projects to relieve Europe’s sagging economy, France would cut its budget by 50 billion Euros. For Sahra Wagenknecht, however, vice-chair of the Left Party in the Bundestag, it was truly tragic “when it doesn’t even occur to a Social Democratic economics minister that sorely-needed investments in infrastructure and education could be made if only taxes on the upper class were increased.” That could be a more promising way to head off a threatening downturn with a further growth of poverty in Europe, even in relatively prosperous Germany. But back to the subject of crow. I’m not referring here to the giant swarms of rooks, a European species of crow, which always spend autumns and winters in Germany (it’s the South to them) and every evening soar dramatically to night-time roosting areas in the big Tiergarten park, then spread out in the morning to dig for food on every larger lawn. Hitchcock fans and many others fear or hate the dark-feathered birds. I welcome them here and am reminded of the many thousands of human migrants, fleeing from barren or bloody homelands (often in northern Africa or the Near East), hoping to find food and shelter here, at least temporarily, but also feared or hated by the ignorant. But “eating crow” has nothing to do with these tough rooks, but rather with tough politics in the east German state of Thuringia. In September elections there, right-wing Christian Democrats came in first (33.5 percent), as every time since GDR rule ended in 1990. For the past five years they shared power with the Social Democrats (SPD) as junior partners. But for the latter, alas, the partnership was very unlucky, costing them a third of their voters and the bitter result, a paltry 12.4 percent, offered good grounds for divorce. They could renew this deal with just a 1-seat majority, but did not like the idea. Pushing well ahead, in second place, was the LEFT party with 28.2 percent. Now if the Social Democrats and the little Greens party (with 5.7 percent) joined hands with the LEFT they could also win a majority of exactly one seat in the legislature, here again just enough to rule the roost. Was that a “lesser evil”? Where does eating crow come in? Twice on this menu. There have been several coalitions between Social Democrats (SPD) and the LEFT, always in eastern Germany and always with the SPD stronger and the LEFT as junior partner; one such in Brandenburg is currently being renewed. But this time, for the very first time, the LEFT would be on top so the minister-president would be their man, Bodo Ramelow, 58, a West German labor official who moved eastwards after the Wall came down. Thus the despised, castigated, reviled LEFT party would finally be represented right up there in the Upper House in Berlin (Bundesrat) with the fifteen other state bosses. Could the SPD and the Greens swallow leadership from this “offspring of the party which once ruled East Germany”? Some people objected loudly; most angrily the Christian Democratic woman who has ruled the roost till now and would thus be degraded, with her fellow CDU deputies, to the chillier seats in the opposition section of the legislature (and right next to the even further rightist deputies of the new “Alternative for Germany” party, whose campaign, aimed at “those foreigners”, at gays and at one another, had won 10.6 percent of the voters and eleven seats. But they were still pariahs and carefully avoided). Would the SPD agree to be a junior partner of the LEFT? The same Minister Gabriel who had said “Non” to the French now said “oui” to his party people in Thuringia; each state must decide for itself. On October 21st the SPD leadership council in Thuringia voted to give it a try, unanimously! They have now put it to the entire party membership to decide – by November 4th. It looks as if they and the Greens will say Yes; the new table for three seems likely to set an historic precedent in Germany. But here comes a dish of crow again, a rather different species, but for some just as hard to eat! 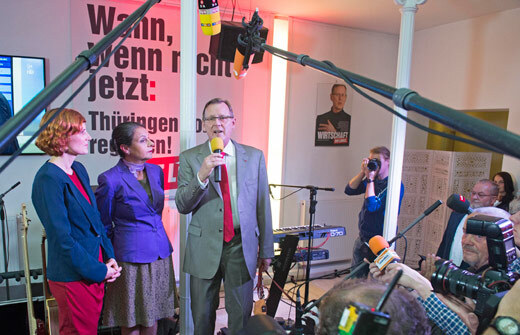 The SPD and Greens, though in the minority, have insisted on conditions for providing the LEFT such a chance. The Greens, for example, demand at least two cabinet seats. Far more controversially, they insist that in the coalition’s program preamble the LEFT must agree that the GDR was an “Unrechtsstaat”, which translates as “unjust state” or “unlawful state”. Otherwise they won’t play! For most LEFT leaders in Thuringia this is no big problem. They want to lead a state government, and promise many improvements like doing away with a traditional West German “tracking system” separating “better pupils” planning on college from “weaker pupils” who aren’t – mostly from working-class and immigrant families. They hope to do more for those with low-paid, precarious and temp jobs – or no jobs. Like the Greens they want ecological improvements. Ramelow, knowing the prejudices of fellow West Germans against the LEFT, hopes to “move a step further in dismantling Cold War thinking.” So most now agree to an official rejection of the GDR in a coalition program. But to some in the LEFT party this is “eating crow” and hardly digestible. Almost no one denies that there was plenty of injustice in the GDR. Elections were surely a farce; censorship prevailed in the media and to a varying degree in films and books. There was certainly repression. But public policy in almost every field of everyday life aimed at improving the lives of working people, students, children and pensioners, with special attention to women’s rights. These humane policies, in contrast with West Germany then and all Germany today, make any sharp categorization as “just” or “unjust” very relative and very complex. After all, West Germany outlawed the Communist Party and leftwing organizations; it spied on their members, dragged them to court, jailed some and barred thousands from their jobs. Its ruling class, in contrast with the GDR, was filled to the brim with Nazis in every field, even presidents and a chancellor, and it supported fascist governments in Spain and Chile and apartheid in southern Africa – also with weapons. After the GDR was gone it shipped its tanks and other weapons to Turkey to help kill Kurds (whom it now supports – unless they are left-wing Kurds living in Germany). It tolerates a situation where millions are jobless, thousands homeless, and 2.4 million children are affected by or threatened with poverty. It has bombed children and other civilians in Yugoslavia and Afghanistan. 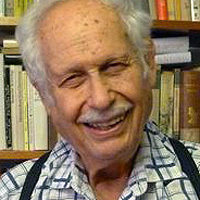 And war criminal corporations and banks which built up Hitler and made billions from war and slave labor – Krupp, BASF, Daimler, the Deutsche Bank – are so close to Merkel’s government that it does their bidding; squeezing the poor in Spain, forcing unneeded tanks and submarines onto impoverished Greece, diluting plans to reduce carbon emissions. Where are the lines between “just states” and “unjust states”? Opponents of such terminology warn that whenever leaders of the LEFT do eat crow new demands are made to grovel even lower and swallow even more. They insist that the entire exercise, stressed most by the once rebellious Greens, really aims at equating the GDR with the Nazi state and discrediting its main feature which, however twisted or mismanaged in many ways, was basically an attempt to abolish war, exploitation and poverty, to build socialism. This explains the many attacks against the LEFT party; these should remain its basic goals. And, these militants insist, one compromise can easily lead to another and yet another, just as it once did with the Greens and, a long, long time ago, with the SPD. Are these critics too fearful, too radical? Isn’t it worth taking a chance with this new alliance, balancing delicately on a single seat majority in the legislature, hence always threatened by blackmail attempts, but with hopes of demonstrating what the LEFT can do when it leads in at least one of Germany’s 16 states? The future is not now full of sunshine; two big strikes – airline pilots and railroad engineers – have rocked the country. Is militancy rising? Can the LEFT join – or even lead it? 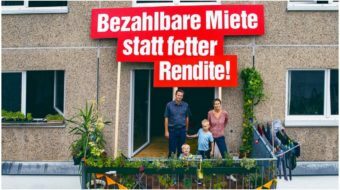 A large leftist party in Germany is a source of badly needed strength and inspiration all over Europe – if it defies the dangers and remains a fighting party. At the moment it looks as if a risk will be taken. Will it succeed? Will it be possible, in 2015, to avoid ending in a political year that “froze to death”?